character wise... the first one (Hana) was a good and strong main girl character and I really loved her. but I have no clue as to why they decided to change the girl to Yui who was like some weakling.... who annoyed the hell out of me. dropped it. Yui is a no. the first part with Hana as the main girl was nice though, so I'll still recommend it. Despite being a cliche 'harem', though personally I don't think it is, I think Crash! is grossly underrated. In fact, I would put it together with popular harems like 'Ouran High School Host Club'. From the start it has a clear direction, with the author having clear knowledge on where she wants to go. Admittedly, the first few chapters are a bit rushed to get to the band working together. I loved the strange quirk that Hana Shiroboshi had, and how each of the boys had their own time to shine was extremely endearing. Hana was confident, sharp-tongued and it was extremely exciting to see her overcome obstacles when it came to people putting down her efforts for the group. There were many inventive ways in which she guided and helped Crash to achieve fame and recognition. I was extremely said when the second half of the series goes to another character named Yui and her point of view, but it was interesting to see Hana from another person's POV. Now, there is a love triangle, yes, and I get that it's the most cliche thing I have ever seen with a black haired dude that's reserved and a blonde haired dude whose cocky, but the manga delivers these tropes really well. There's an incredibly reasonable answer to why Kiri (blonde guy) falls in love with Hana, and it makes sense why Rei (black-haired guy) falls in love with Hana, which is a spoiler. The more minor characters are also extremely good. Junpei gets an incredibly fun arc about him growing by being put in charge of creating lyrics, and Yugo has an interesting arc, being the flirty observer of the groups' love lives. Kazuhiko Midorikawa is at first the 'Honey' of this story, but when Yui takes the reins and becomes the main character, he gets an incredibly amazing character arc that makes him grow! Despite being classified as a harem, there are like 3 guys in love with Hana, and the one of the guys isn't even part of the band. Kind of like Ouran High School Host Club. You won't see romance at the very beginning, but it will grow as you keep going. 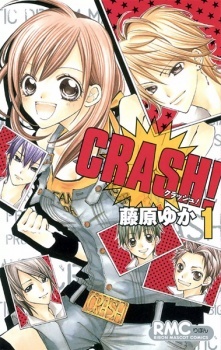 If you would like a long, comedic and romantic read heart-warming, a little quirky and romantic, I definitely recommend Crash! Unbelievably, there are no reviews so it's time for me to shine! Well, this is my 1st review, but hope you get it *///* I'm also underage haha... Yeah. Honestly I loved this manga, probably the best manga I've read so far, well, that's what I always say after completing a manga, but it's really good y'know? It has that really funny comedy in it that makes me smile and make my parents think I'm weird. But the best part is probably the cuteness of the pinch of romance from the boys. The art is unbelievably good. The fashion is totally fab. But well, you need fabulous clothing for idols. But what I mean by idols is there's this girl that lives at an agency, her parents work at, and she helps out finding idols - With the power of hers. Now here's the part where I can't talk about, due to spoilers, which I can't talk about cause this is only a review, but, you probably know how it turns out. It's really cute, awesome, it'll just make you wanna fan-girl as much as the people in the manga did! It's just to hard to explain this is words, it's just... AWESOME! I'm not sure if they got the number of chapters their are, but pretty sure there are only 37. It say 73. Mixed up? There you go! Common! Go read that manga now!